What are the elements involved in teaching homeschool music? Learning that perseverance carries its own special reward, and its own special recognition. Leaning to be a part of a group like an ensemble or a band and being an important spoke in the wheel. I think we would all agree that music can enrich and add to our appreciation and enjoyment of life. Some thoughts on music teaching ideas. Teach your child an instrument. I find teaching a recorder a great place to begin. It is easy and quick to learn and at the same time your child will learn many elements of music theory. 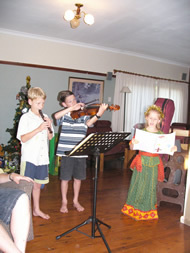 Find a teacher who loves to teach the musical instrument your child is interested in. Look for online music lessons. In this computer age, there are online music courses using video and audio. Teach Your Child Violin for example has online violin lessons and I am very impressed with the preview which I have seen of this course. Read more here. Worship Guitar Classes for Kids - Christian Guitar DVD course. Music throughout History - Placing music in its historical context helps us to see the integration of life and culture in the lives of various musicians. Not only do we read about the musicians, listen to their music, but we can place them into the time period, study the philosophies of the age, learn about their contemporaries and view the art work of that same time period. We can learn about music throughout History using CDs, different curriculum and reading certain books. Read more here for some ideas. Home School Music Curriculum : Elements of Music - If you would like to teach Music Theory and Appreciation, you will love the systematic approach in The Elements of Music by Wendy Hill. The Elements of Music course uses the God-given physical senses in a wide variety of ways to help students appreciate and discover more about music and its Maker. Read more here. Classical Destination Music Course - more about this soon. Home school Music across the Curriculum How do you use music in Math? Geography? Science? Here are some ideas.